Qiao Feng Technology Industrial (Shenzhen) Co., Ltd. (also known as Qiao Feng) is one of China’s leading plastic and mould manufactories. To date, the company has developed into a one-stop, high-tech specialist that offers not only a diversified range of products but also specialised techniques and services. Just to mention a few: our product categories include automotive parts, bill and cash handling machines and aircraft sitting; and our services ranged from structure design, mould building, plastic parts production, and parts assembling. Our clients are distributed throughout the globe. We have produced for world-class automotive brands such as BMW, Volvo, Tesla, Volkswagen, Mazda, Ford, GM, Haima, Honda, Nissan, Subaru. Since establishment, Qiao Feng has invested more than 58.5million USD. The size of Qiao Feng’s workshops, factory, office and staff accommodations adds to 63,000 square meters. In addition, equipped within the workforce are hundreds of world-class, high-precision and state-of-the-art machineries and testing equipment. The Qiao Feng Family consists around 1,200 employees, of which almost 20 percent have been employed for more than 10 years and around 20 members have been employed for 20 years or more. Our aim is to enlist, develop, and mobilise as many potential talents as possible to join our team to grow and strengthen the movement for mould making and plastic injection industry. With such mission statement and aim, the company has built a solid foundation of proactive and innovate spiritual characteristics across all level of its staff. Please see our core values for more information. Our success only comes when we hold true to our shared goal and core values. Quality, Technological Innovation, People, Safety, and Clients are the core values of Qiao Feng. 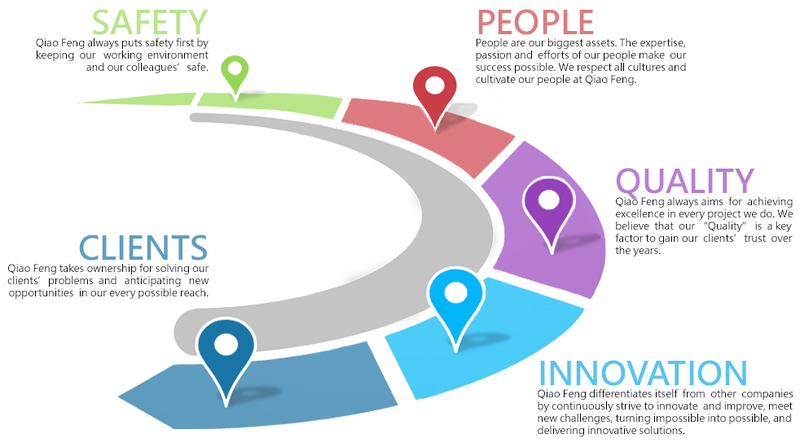 Therefore, the products and services we deliver to our customers comprise with these values. Qiao Feng has gone through a series of developments in all directions to strengthen its capabilities. 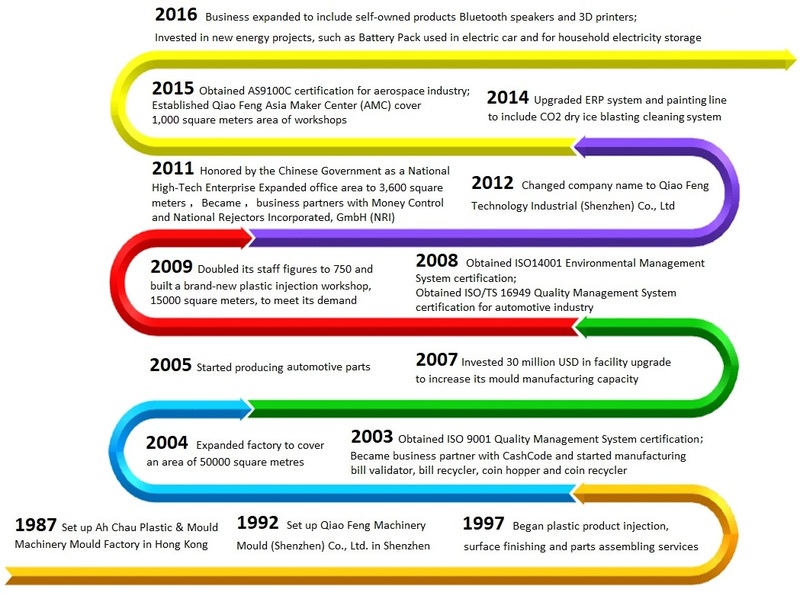 The timeline below indicates the important stages that had contributed to the Qiao Feng today.